LPA Design just announced a new model PocketWizard wireless radio transceiver. The Plus III is a feature-rich update of their basic wireless radio transceiver series model and can be used to trigger both flash and camera remotely. 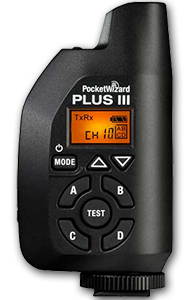 The new Plus III touts the same 32 Standard channels and Quad-Zone triggering as their flagship model PocketWizard MultiMAX (the previous Plus series models only had 4 channels), as well as several other key MultiMAX features such as its Long Range and Repeater modes. Photographers will love the fact that the remote now also features a two-stage remote camera triggering that enables the transmitter unit to simulate both the half-press and the full-press of the remote camera's shutter button. The new version is also capable of faster continuous shooting; up to 14.5fps compared to “only” 12 with the previous model. While there are various (and cheaper) alternatives on the market, PocketWizard is still the brand of choice for most (professional) photographers.